For other Similiar Pests & Biting Insects please scroll down. Bed bugs, yes we do them... $330 per room for the average home, you will need to allow 3 hours for complete treatment. Special Warning Notice - BED BUGS. We wish to advise all travellers to be very careful of bedbugs in hotel rooms. The bites are not a big deal, but it is a VERY big deal if you take them home in your luggage. It is also a very expensive disaster if they spread through the bedrooms in your home. It may well end up costing you thousands of dollars and this is not an exaggeration. If possible, don't leave your suitcases in the hotel bedroom. Keep them in the living room if you are in an apartment or holiday unit. Check yourself for bites (especially on your legs or torso) when you awake in the morning. When you return home, if you have the slightest concern about bed bugs, then don't take your luggage into your bedroom. Open it, empty it and store it in your garage away from areas where people or pets sleep. If you do find bed bugs in your luggage, take it along to a fumigation specialist, or take it to the tip if you prefer. Prevention is better than cure (and much cheaper), so please enjoy your travels. Just take a little care and try not to bring any bed bugs home. Insurance companies don't cover damages caused by bed bugs. It isn't possible to stop your guests from bringing bed bugs into your building. There is nothing you can do to stop bed bugs from leaving a guest's suitcase and infesting a room. It doesn't matter how clean you are or whether you are a 5 star hotel or a low cost backpackers. In most cases the guest will be completely unaware that they are even carrying the bed bugs in their luggage. The early detection of bed bugs is difficult. They are very hard to spot. Thoroughly train all your housekeeping staff about bed bugs. They need to know how to check beds and identify bed bug activity. Linen trolleys should be inspected every day. Laundry companies should be consulted. 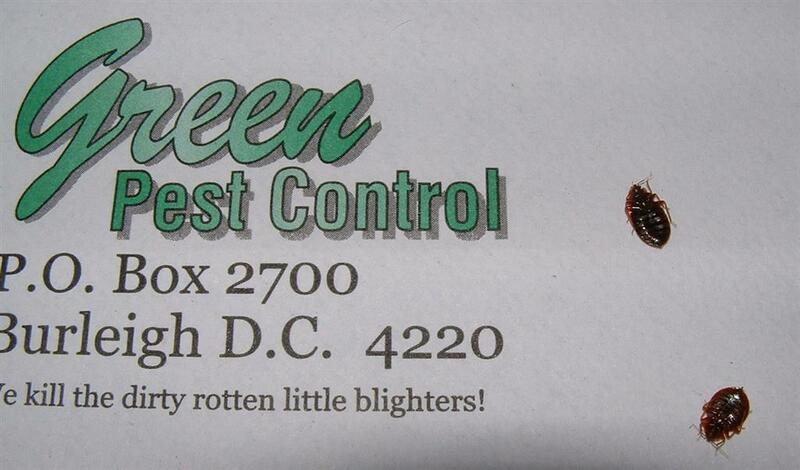 It's important that their pick-up and delivery vehicles should be certified free of bed bugs. Advise your guests. Every guest should be handed a notice upon checking in. It should state what bed bugs are, their habitats and how to identify them. It should also mention their bite so that your guests can report back to you if they even suspect that they have been bitten during their sleep. The wording should alert your guests as a warning but not be alarmist. You should seek legal advice to protect yourself with the best and clearest wording. Several hotels are already dealing with the threat of legal action taken against them. The current policy is to hush it up. This is wrong. As a pest controller who talks with other pest controllers, I can tell you that the problem is worldwide and wide-spread throughout Australia. There are no known "simple" prevention methods. It is your duty of care to warn your guests. If you do not warn your guests you may be leaving yourself open to liability. Bedbugs can not be easily prevented. No amount of pesticides will prevent them infesting a room, and too much pesticide may present a reactive health threat to a sensitive guest. If the accommodation industry as a whole, or the government implements a standard bed bug warning notice to be handed to all guests, it will go a long way to covering your duty of care. Responsible action needs to be taken NOW. Without doubt this is potentially a serious problem for the tourist industry. I don't want to be a doom and gloom prophet, but the tourist and accommodation industry needs to bite the bullet and address this problem before the problem bites first and things get further out of hand. Bed bugs are world travellers and now a worldwide problem, not just a local problem. I implore our current affairs programs not to blow the bed bug problem out of proportion. We don't want people to stop having holidays or to boycott our fabulous Australian resort areas. Nor do our accommodation houses want to be sued by guests who take the bed bugs home... only to have a bed bug treatment bill of thousands of dollars a few weeks later, and sometimes a medical bill also. The steps listed above need to be taken straight away to avoid serious loss of trade or legal action in the future. We are available to train and advise your staff on how to spot bed bugs in a room. Please call 1800 6 12345 to arrange a consultation. So call us for a quote if you need help with any of these. Should you have something unusual, please collect it in a jar if you can (and if it is safe) and we will try to identify it for you when we visit.